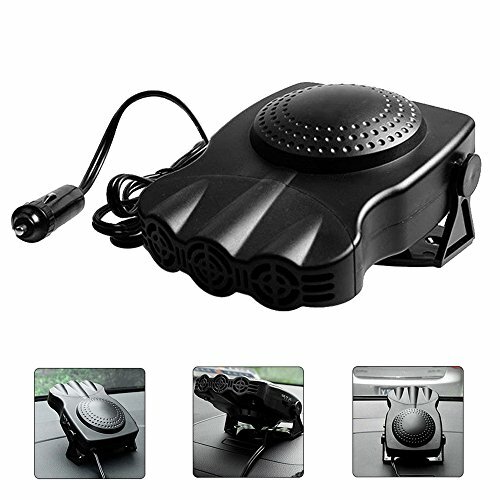 A portable car heater is a compact, lightweight device designed to generate and disperse warm air within the confines of a vehicle in order to heat it up. While they are designed expressly for the purpose of heating up the environment they are placed in, most of them also go the extra mile and are capable of generating cool air when switched to a specific mode. Since they’re ‘portable’ and can be moved around, they can be used to supply heat to whatever area of a car is in need of it, and they can also be used to defrost windows that are regularly plagued with frost and therefore become a flight risk in the winters. 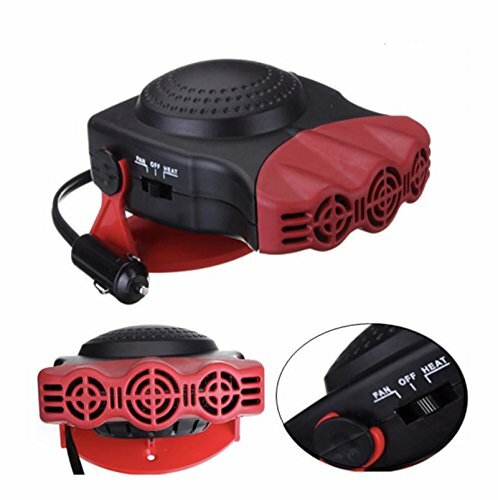 The Tvird 12V portable heater for cars simply ticks all the boxes when it comes to these products – the heater has a strong, long-lasting build, 150 watts of heat output, three outlets for heated air and offers up to 180-degrees of rotation. Tvird’s portable car heater is the premiere choice for anyone looking for a portable heater for their car, and that is so for good cause. Tvird’s portable heater even has two different power levels built into it so that the user has even more control over the heat and can easily adjust it according to the temperature outside. In addition to heating up cars, the product also doubles as a window defroster/demister which can be used to get rid of frost or mist that has taken up residence on a vehicle’s front or rear windshield (or even on the driver’s/passengers’ windows). 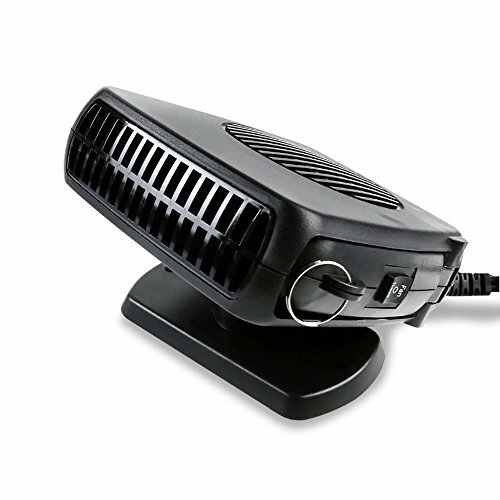 The 12 volt portable car heater manufactured and distributed by Ixaer boasts a strong exterior that ensures the product has a long life, three outlets to ensure warm air is dispersed in all directions of the area the heater is pointed towards, and innards that are capable of generating heated air in as little as 30 seconds of the heater being turned on. The product is compact enough to be placed anywhere in a car and not cause any hindrances and comes with a 360-degree rotating base that allows for it to be pointed in whatever direction the user desires. The Ixaer offers 150W of heat output and, apart from helping heat a car up, can also be used to defrost windows and even blows out cold air when it’s hot outside if simply put into cool-air fan mode. 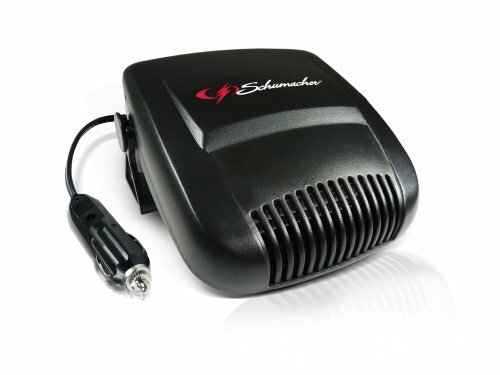 The Schumacher’s most noteworthy feature is not something tangible, but rather its price tag – where most portable car heaters come it at somewhere between $15 and $30 (and only go up from there), the Schumacher costs has a measly price tag of ~$11. Do not mistake its low price for its weakness, however, as the product offers a lot of bang for your buck. While the unit doesn’t excel quite well at what it does, still the current optimization that has been described as somewhat lackluster, it does an amazing job of heating up your car within minutes and is more than competent at supplementing your car’s native heat output – which is what portable car heaters are designed for in the first place. The Schumacher has an adjustable bracket that can be mounted anywhere on a car, is rated at 150 watts and doubles as both a heater that can be used to heat up your car and defog your windows and a fan that can be used to blow cold air throughout your car in the summers. 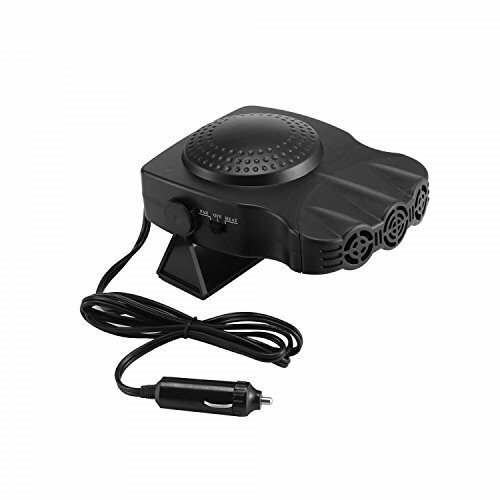 This nifty little product from niceEshopTM is among the best of the best when it comes to portable car heaters. This unit comes with a gargantuan 47-inch cable so that you can use it to disperse heat even to the backseat of most cars, and the cable is also thicker than most of the competition to make sure it doesn’t negatively impact your car’s wiring. This heater, with its three heat outlets and quick heating mechanism, is up to the challenge of both quickly heating up a car and defrosting and demisting its windows and windshields. With its premium quality exterior and a copper cable, longevity was definitely on the minds of the people who developed it. The unit rotates 180-degrees to allow for warm air dispersion to every nook and cranny of a car. If you do not want to move the heater around the car, you can simply mount it to one location using double-sided adhesive tape, although that’s not included in the packaging. Last but most certainly not the least is this little vixen from NAZUMAS. With a strong ABS plastic exterior, this unit is designed for long-lasting portable car heating. The NAZUMAS car heater has a 54-inch cable that allows for it to be moved all over a car, but the unit is also highly effective when mounted to a car’s dashboard. The unit is lightweight even though it is made of premium plastic, and being rated at 150 watts, it heats up faster than the average car’s built-in heating system so it’ll have you and your car warming up and comfortable while you wait for the car’s heating system to warm up and make your experience even more pleasant. The NAZUMAS plugs into basically any 12V DC outlet, and its 180-degree rotating base allows for improved logistics. For those who would prefer the NAZUMAS mounted to their dashboards, the base can be mounted anywhere using double-sided sticky tape which, fortunately, is included in the packaging.